The beginnings of baguettes at Central Food. Down in the burgeoning Kendall Yards development, "Wilma's children" are working hard. They're fed twice a day in the kitchen of Central Food, the eclectic restaurant owned and operated by longtime local chef David Blaine. And across town, in the new Saranac Commons shared market space, chef Jeremy Hansen keeps careful watch over Common Crumb bakery's "Five Mile Mother," so named for its origination at his home in the Northside neighborhood. These quirky names refer to the active-yeast bread starters, formally called levains (a French word, pronounced "le-vAHn," for the mixture of flour and water that's also home to a colony of active, natural yeasts and bacteria), used at each of the bakeries to make countless loaves, buns and baguettes rise into crisp-crusted, air-bubbled perfection. It's the use of these naturally occurring yeasts — in place of the fast-acting yeasts used in most bread nowadays — that sets these three Inland Northwest bakeries apart. "It's an art, and I love the art of all food," proclaims Hansen, who opened Common Crumb Artisan Bakery in the late fall of 2014 with his wife, Kate, to complement Santé Restaurant & Charcuterie, their hyper-local, French-inspired eatery on West Main Avenue downtown. "It's necessary as a chef to understand all aspects of food. But more importantly, for the health of people, fermenting bread and making it right is better than a quick-rise, with all these additives that make it quicker and easier for production," Hansen adds. The process to make bread using this long-practiced method is slow — hence, why most bread isn't made like this — but the outcomes are well worth the effort. 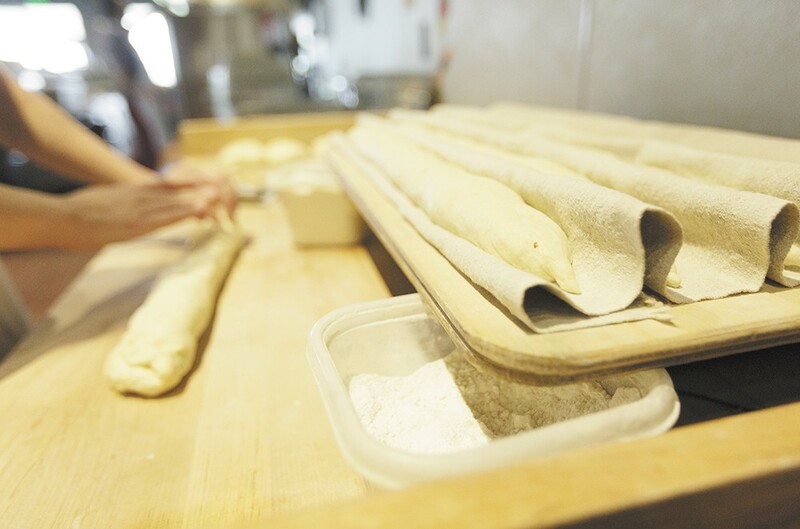 At Central Food and Common Crumb, the baking process is about 24 hours from start to finish. "We could do it in less time, but it wouldn't be the same bread," says Central Food's Blaine. "It's surprising that bread made this way connects with customers, and we really like that. That is the whole philosophy — we like that food is a part of people getting together." In an age where technological convenience and speed are cultural norms, "artisan" has become a buzzword for the marketing of just about anything. We have artisan pizza, artisan soaps, artisan jewelry, artisan cocktails and artisan cheese. "'Artisan' originally just meant, this is someone who has devoted time and effort to get good at something very specific. So when we say it's artisanal bread, it's like they used to make bread, is what we're really saying," says Blaine. "I think overall in food, the biggest shift has been that the story of the food has become more important," he adds. "People are always asking where is this [ingredient] from, the farmers markets have been expanding, and people are just interested in the story of the food."